The Royal Hotel Cardiff is a boutique-style hotel that is situated on St Mary Street in the heart of Cardiff city centre. From here it is only a few minutes walk to the Millennium Stadium and less than a 10 minute walk to the Cardiff CIA. This cool and contemporary hotel has 64 guest rooms. Each guest room features: air-conditioning, triple-glazing, cafetiere coffee, herbal teas, mineral water, laptop safe, salon-style hairdryer, cd/dvd player, lcd or plasma tv and broadband internet access. 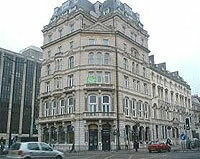 Restored and modernised hotel in very central location. The Scott Room can accommodate 130 guests for conferences, private functions and weddings.